Use Perfect Property to find your next perfect house to buy in Shankill. Shankill is a town located 17.4km south east of Dublin’s city centre. It is about a 35-minute drive by car via the N11 and M50 Motorways. The DART, the Luas rail line, and a number of Dublin Bus routes primarily service the area. There is also an Aircoach service that links the town to the Dublin Airport. Shankill’s population is around 14,000. Shankill homes are traditional and rich in Period architecture. The town is host to several well known Castles and Mansions, including Clontra, Crinken Castle House, and Shanganagh House. 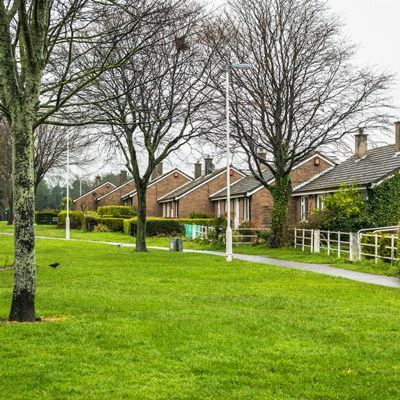 Residences are delighted to views of an expansive sea, the beautiful Dublin Mountains, lush greenery, verdant parklands, blossoming gardens, idyllic terraces, and mature trees and meticulous landscaping. Home styles have retained old-world character, and one can expect to find styles of Victorian, Edwardian, Georgian, Period, contemporary, modern, cottage, and Terraced. New construction and refurbished dwellings include: modern amenities, spacious floorplans, beautiful décor, and energy efficient technology. Shankill is equipped with a Village Centre that has retail shopping, convenience stores, a postal service, and small businesses. There are also a number of delicious restaurants, cafes, and pubs. The town has another shopping centre in development, to include larger-scale retail outlets. Shankill is historical and is home to numerous sights, such as Puck’s Castle, Shankill Castle, and Martello Tower. The town is plentiful in trails for walking, cycling, hiking, picnicking, and recreational and leisure activities. Most notable is Shanganagh Park and the Brady’s Pub trailhead to the Dublin Mountains. There are various sporting facilities, including Shankill Tennis Club, soccer teams, Shankill Bowling Club, rugby club, golf clubs, and various water sport activities. Shankill is also a member of the Tidy Towns initiative. Shankill is host to three primary schools, a national school, a Scoil school, and a Parish school. Educational excellence is a top priority, and school awards include: Full attendance awards, and sporting awards. You can filter Shankill properties by price, bedroom size, square footage and more. There is also the option to filter by a property must-have, such as an ensuite if you are seeking a house to buy in Shankill where you have a direct bathroom from your bedroom, or even a home in great condition or one that's been refurbished. You can also check apartments for sale in Shankill if you are looking for something a little smaller. Don't let the perfect apartment, townhouse or house for sale in Shankill get away. Looking to rent in Shankill? Search houses for rent in Shankill and filter by home types, price and size.